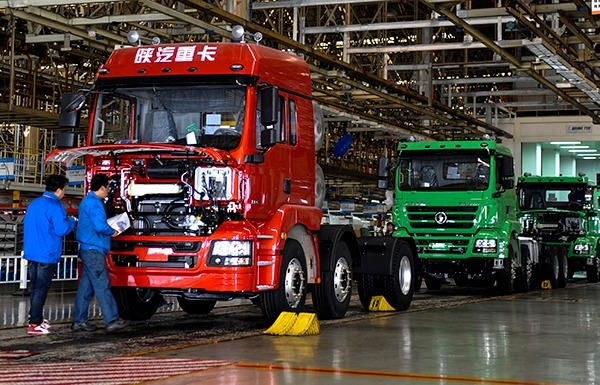 China's truck manufacturing giant opens first assembly plant in Algeria - The Maghreb Times ! China’s truck manufacturer Shaanxi Automobile Group on Tuesday inaugurated its first assembly plant in Algeria, as part of a joint venture with its Algerian partner Mazouz Trade Group. The inauguration ceremony was held in the assembly plant in the eastern province of Setif, with the presence of Yuan Hongming, CEO of Shaanxi Automobile, and CEO of Mazouz Group, Ahmed Mazouz. The assembly plant that will manufacture the vehicle, under the brand “Shacman,” is due to produce yearly as many as 3,000 heavy-duty trucks of international standards under the latest models, sold in both local and foreign markets. The company also signed contracts with foreign operators from Tunisia, Egypt and Mali, where Shacman trucks assembled in Algeria would be exported. “The establishment of an assembly plant in Algeria is another massive step in the cooperation between Shacman and Mazouz Group, and I believe such a plant would accelerate the development of automotive industry in Algeria, as we are going to train more talents and create more jobs here,” said Yuan at the opening ceremony. Mazouz specified that this first ever assembly plant will create 8,000 jobs, including 1,600 direct jobs. Two other Chinese operators, namely mini trucks and passenger cars under the brand Chery, as well as buses under the brand Higer, will be soon assembled in Setif after the two brands signed partnership contracts with Mazouz Group. The Algerian government has been making an effort in recent years to boost the automotive industry to diversify its oil-dependent economy and reduce exorbitant car imports bill which hit 7.5 billion U.S. dollars in 2014. The North African nation has provided licences for several foreign car brands to install their assembly plants with local partners. French automaker Renault was the first to open a car assembly plant here, followed by other Asian and European brands, such as Hyundai, Kia, Volkswagen and Shacman.